For use as a training tool that allows dogs to communicate when they’d like to be let out. Looped end allows for easy hanging. This worked so good for our little puppy. No accidents in just a few weeks. Sometimes we miss the cues when our four-legged friends need to relieve themselves. If that happens, we’re stuck with a mess to clean. To help avoid dog accidents in the home, Cheryl Pederson created PoochieBells, a potty-training system that teaches dogs to ring the bells when they need to be let out. PoochieBells are straps that hang on a doorknob. When your dog wants to get your attention, the bells are right by the door, ready to be nudged with a nose or shaken with a paw. The premise of PoochieBells is based on the idea of conditioned reflexes, made famous by the renowned Russian physiologist Ivan Petrovich Pavlov. The goal is to teach your dog to associate the ringing bell sound with a signal to go out, and PoochieBells includes training instructions to help you and your pooch get in the habit. Cheryl wanted to give her dog a tool to communicate, even when the house was noisy and full of activity. Her PoochieBells are simple and well made, with two sets of bells on each strap so both small and large dogs can use it. 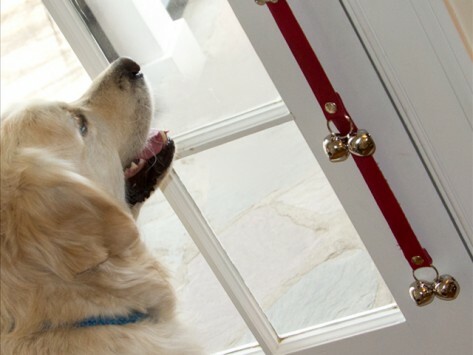 The pet-safe bells come from a manufacturer in East Hampton, Connecticut, that’s been in the bell business for more than 200 years. Cheryl also offers dog-friendly pewter hooks for mounting near the door, in case you’d rather not hang the bells on a high-traffic door. PoochieBells are a great reminder of just how smart our pets can be. All they need is a tool to help them communicate with us.